Village Homes of Fort Worth, established in 1996, is a locally-grown and family-owned company built on the foundation of timeless craftsmanship, innovative living and construction excellence at a value. Established with the idea that the homeowner experience should be enjoyable and collaborative, Village Homes’ enviable reputation is based on the successful use of modern floor plans and elevations that stand the test of time, an unparalleled design selection and project management process, and excellent customer service after the sale. The Village Homes team provides buyers with the home of their dreams while operating with a true commitment to integrity and insuring clients are partners in the process. Building a new home can be a daunting task, but Village Homes has the most experienced team in the area to guide you every step of the way! Design and building teams work in an organized, efficient manner– making buying or building a new home an enjoyable and rewarding event! 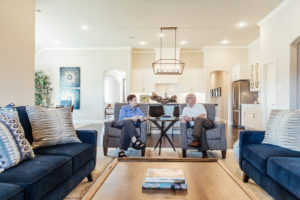 Village Homes began as a result of its president and co-founder Michael Dike’s experience, post college, working for one of Austin’s leading production home builders. He quickly realized their cookie-cutter design approach did not match the creativity and passion for home design and construction that he held, so Michael went on a mission to create a company from the ground up with the innovative and strong principles described above. He discovered a like-minded Fort Worth developer, Jim Harris, and soon after, Village Homes was born. Specializing in blending the style and quality of well-detailed existing homes from other eras with innovative open floor plans, smart technology, and energy efficiencies that modern buyers expect, Village Homes continues to be the Fort Worth leader in new home construction.